If you’re looking for help creating a beautiful outdoor space to enjoy food and friendship, you’ve found the right place. Being outdoors with family, friends, and guests; enjoying barbecued food or sipping beverages around a fire pit is a great way to spend time. It’s even better when the surroundings are full of wonder and provide a naturally restful respite from office walls and stale, interior air. Maybe you already have a landscaped yard, but you want unique enhancements added to it. Want a selection of custom outdoor fireplace, firepits and grills designs to pick from? Maybe you’re looking for outdoor BBQ designs? We do those and a lot more. If you like to entertain and dine outside, consider an outdoor kitchen enclosure, built-in seating, or a fireplace that looks as though it were made with genuine stone. If you’d like part of your outdoor space to be a serene place for relaxation or contemplation, think about a grotto or meditation garden that fits gracefully into your existing landscape. If you have an active family, what about an outdoor kitchen and sports court? One of the most popular enhancements to outdoor living is a fire pit. Fire pits are the perfect way to provide warmth on cool evenings, extra ambiance for casual gatherings, and additional outdoor cooking possibilities. They can be used just as constructed or a lidded or screened metal insert can be added for improved safety. Whatever you can imagine, we can create it. See our outdoor fireplace design pictures to get your imagination excited. Once you have an idea of what you’d like to see around your home, the next step is figuring out the materials to use. At Horizon Landscape we’ll work with you to understand your landscape goals and needs. With 40 years of experience in the Bergen County area, we’ll help you select the best building materials for your project from the options below. Stone (in the form of locally quarried bluestone) and pavers (precast masonry blocks) can be dry laid to form beautiful outdoor kitchen patios. Stone and pavers come in a great variety of colors, sizes, and shapes so they can satisfy many visual requirements. When laid correctly they are also very durable and long-lasting. Click here for more information about stone and paver options. Our custom concrete or mortared masonry introduces three-dimensional depth and character to your landscape. 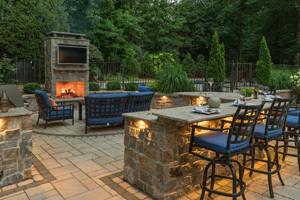 The most beautiful patio barbecue designs are formed with masonry techniques using natural or man-made cultured stone with brick and blocks. We often make custom walls using brick and blocks to enclose custom outdoor kitchens. We use cultured and natural stone to create one-of-a-kind fireplaces, fire pits, and as back splashes for outdoor kitchens and their cabinets. Click here for more information about masonry options. A relatively new landscape construction technique is stamped concrete. Using stamped concrete enables Horizon Landscape artisans to create the perfect color for your project from a broad palette of dyes. We stamp and carve the concrete by hand to create unique outdoor barbeque designs that range from I-can’t-believe-it’s-not-natural to amazingly fanciful. Click here for more information about stamped concrete options. At Horizon Landscape we take your outdoor kitchen and patio projects from concept to completion. Put our 40 years of experience to work for you – call us at (201)848-0022, email us, or stop by our Wyckoff office today!